"I think people should have beautiful things," says Li Pon ä'-te-fakt's owner Linda Pon Owen. "They shouldn't be out of reach." 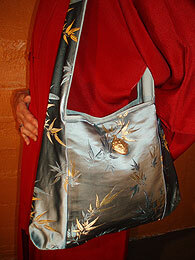 Pon Owen stitched her first bag by hand when the elegant silk numbers she saw at stores were "out of reach" for her. This lovely-but-sturdy prototype carried her books while she rode her bike around town. Nowadays, Pon Owen stitches the bags on a machine. Most are silk brocade, with durable linings of denim, raw silk or reclaimed upholstery fabric. Some have bamboo or plastic handles. All are reversible. 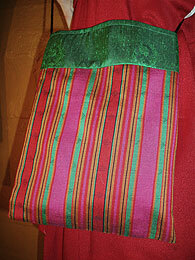 In this, Pon Owen has been inspired by the Japanese kimonos she features in her store. "I want it to be as beautiful inside as outside. 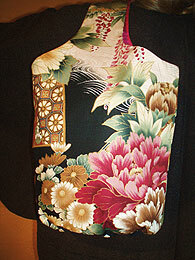 If you look at the kimonos in the shop, the inside is very beautiful. Some of the patterns are so subtle you don't even notice them until you get very close or they catch the light a certain way." 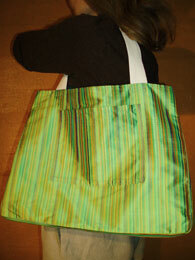 But don't let the delicate looks fool you: these bags are made for walkin'. Pon Owen asked a recent customer if her purchase was a gift. "No," the customer replied. "I'm going to use it as a diaper bag." 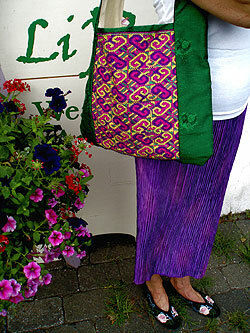 Pon Owen's bags can be custom-made or purchased at the Li Pon boutique or Farmers' Market booth. Paula Melton is Assistant Editor for Gallery Walk and a free-lance publicity writer for the arts.